COBALT STUDIO hosts an opening reception on Saturday, March 29, 2014 from 5-10pm at 1950 W 21st Street, Chicago, IL. 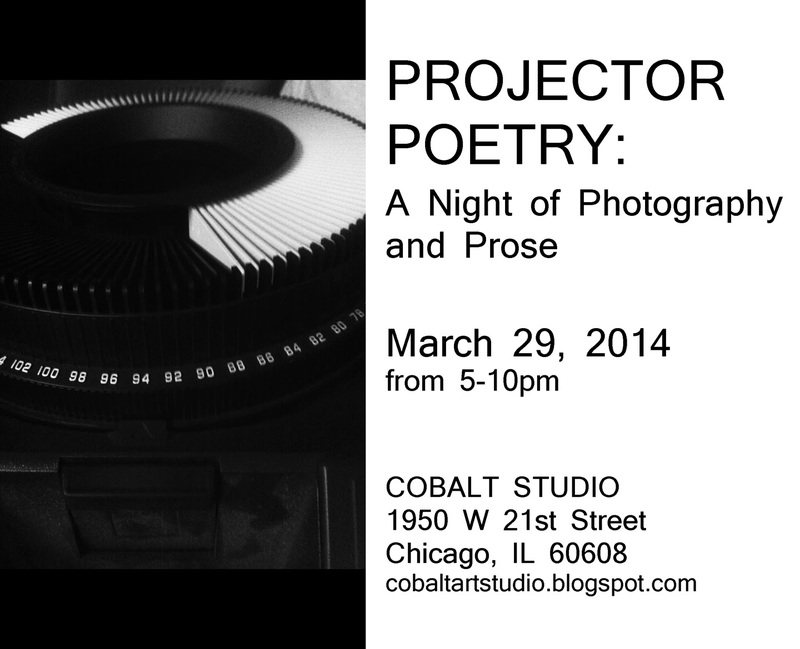 COBALT STUDIO is proud to present PROJECTOR POETRY: a Night of Photography and Prose, the next exhibition of 2014. As the title suggests this is a one night event combining photography and poetry. The work will be on either be projected digitally or on 35mm slides using an old school projector. Poems will be read by a variety of participants. The selection of photographs will be re-visited work, new work, or part of a personal collection and in-process portfolio of each photographer. This event will be a contemporary take on an old fashioned slideshow night with talented photographers and poets. The images, poetry and libations will keep us warm helping us to forget these cold winter nights! Cobalt Studio is an artist run alternative exhibition/project space in the Pilsen neighborhood of Chicago. The name refers to blue-collar/working class status. The space is Antonio Martinez' art studio. He exhibits work by emerging artists and experimental art collectives, as well as invites guest curators that share a common vision. Cobalt's mission is to present contemporary practices that are relevant and engaging to the community. More information about Cobalt Art Studio can be found at cobaltartstudio.blogspot.com. Call for Artists " Collaboration Show 2014 "